Dina Del Bucchia. 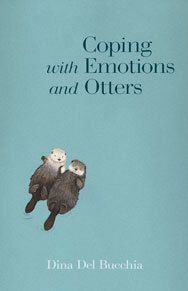 Coping with Emotions and Otters (Talonbooks 2013). Clearly, Dina Del Bucchia has spent a lot of time with self-help books & they have proved very useful, at least in helping her find a way to write her own, wry, odd, often devastatingly subversive version of the genre. Such books are hortatory, & Del Bucchia has learned those sentences, & how to pass them, very well, indeed. The sentence, then, serves as the backbone of these poems & prose poems, carrying the information they insist we need to cope with the emotions – jealousy, shame, anger, happiness, & guilt – the first part of this book, ‘Emotional Outlets’ (& the box-store implication feels proper), insists it can teach us how to live with. This is your rage meditation. Of course, the tone changes somewhat with the emotion being taught. But as a line in ‘How to Be Happy’ has it: ‘Paid in print is truth.’ Del Bucchia underlines & undermines that (un)happy fact throughout these funny-awful admonishments to her readers on just exactly how they are to be. looted from the gift shop. These pieces achieve a taut balance between satiric distance & sad self-laceration. And lead to the final poem, ‘The Saddest Person in the Room,’ who ‘does not want to answer / to people who want to shape his taste,’ who just ‘wants to clear the gallery / and build a volcano out of wire and plaster of Paris.’ I’m not sure what, exactly, Del Bucchia wants to do, but I’m pretty sure she sympathizes. Coping with Emotions and Otters has pushed firmly if in a roundabout way to that final line.